Trudging up and down numerous rolling hills isn’t exactly how many of the third annual Run Rogue 5k participants hundreds spend their Sunday mornings. But when it’s for a good cause, like raising money to fight cancer, participants couldn’t have been happier to be spending their morning that way. More than 350 runners — including three athletes of the wheelchair division — came together on a chilly Sunday morning to conquer the 3.1-mile course in Fairfax Corner and also raise funds for Life with Cancer and Accelerate Brain Cancer Cure. [button-red url=”http://results.chronotrack.com/event/results/event/event-6956?lc=en” target=”_self” position=”left”] Results [/button-red]Just two months ago, Joey Russo and Dan Russo lost their father, Tom, to cancer. During Tom’s illness, Life with Cancer, an organization that provides education and support to those living with cancer, helped out the Russo family “quite a bit,” they said. More than 50 of the Russo family’s friends, along with who sported stickers on their shirts, which read “Team Tom”, ran the 5k. They may have come through the finish line at all different times, but everyone on the team, including his wife and two daughters, ran for the same cause: in memory of Tom’s legacy and to raise money for the organization that helped his family get through a tough time. The two brothers, who described themselves as “casual strollers,” received overwhelming crowd support as each of them crossed the finish line. “It’s so great to be part of a race that honors all the survivors and those lost to cancer who are in our hearts and minds,” Joey Russo said. 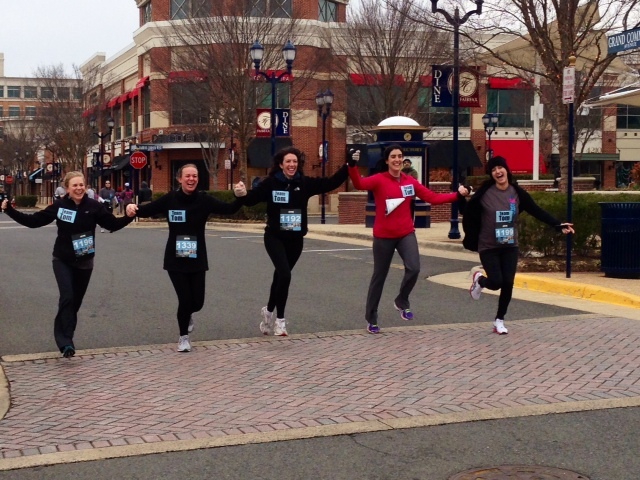 While competitors of the race turned the corner for the home stretch located at the Fairfax Corner Shopping Center, they were greeted with an unyielding chilly headwind. But that didn’t stop Landon Peacock from pulling off a fast kick to the finish. “I grew up in Michigan and ran for Wisconsin so the cold is second nature to me,” said Landon Peacock, the overall winner. Peacock and runner-up finisher Chalie Bitew gapped the pack by nearly two-minutes. Peacock clocked in at 15:29 and Bitew at 15:43. The location of the race’s start and finish line was local to many residents of Fairfax, Va. and the surrounding area but also helped provide a short commute to work for some of the participants. Elena Jamison, Leslie Magner and Monica Vancourt finished a 5k before their workday began at Lucy, a women’s active clothing store in Fairfax Corner . Aside from the convenient location of the race, they also recognized the importance of the cause. “Everybody has someone in their life that has been affected by cancer so it’s for a good cause,” Jamison said. In the women’s division, Tezata Dengersa won with a time of 17:53, an almost-two-minute lead over second place finisher Kristi Markowicz 19:52. Leader of the wheelchair division, AJ Nanayakkara, pushed into the finish line with a time of 46:23. For many, this was their third year in a row competing in this year’s Run Rogue 5k. Brian Hansen said he and his daughter (in a stroller) keep coming up for one main reason. “My mom’s a cancer survivor so we run to honor her and our friends whose children have cancer,” Hansen said. As Hansen and his daughter finished the race, his mother, greeted them at the finish line. With the help of 350 participants and a dedicated group of volunteers, organizers hope total fundraising will top the roughly $20,000 the last two years have yielded, which will be split evenly between the two charity groups. “We hope next year to come back with a new course, warmer weather and a big turn out,” Jahshan added.